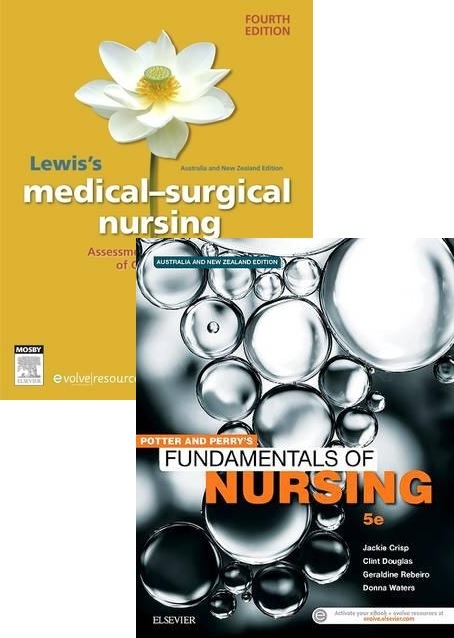 This pack includes: - Lewis's Medical-Surgical Nursing 4th Edition - ISBN: 9780729541770 and; - Potter & Perry's Fundamentals Of Nursing 4th Edition - ISBN: 9780729542364 - Potter and Perry's Fundamentals of Nursing, 5e continues to set the standard as the leading fundamentals text for Australian and New Zealand nursing students. The 5th edition has been carefully revised and restructured, focusing on the very important basics - the fundamentals of care that are the building blocks on which professional nursing practice is built. Potter and Perry's Fundamentals of Nursing 5e will prepare students for the dynamic and evolving nature of nursing practice and will challenge them to become competent, engaged and agile nurses of today, leading the way to be effective nurses of the future. - Lewis's Medical-Surgical Nursing: Assessment and Management of Clinical Problems, 4th Edition is the most comprehensive go-to reference for essential information about all aspects of professional nursing care of patients.